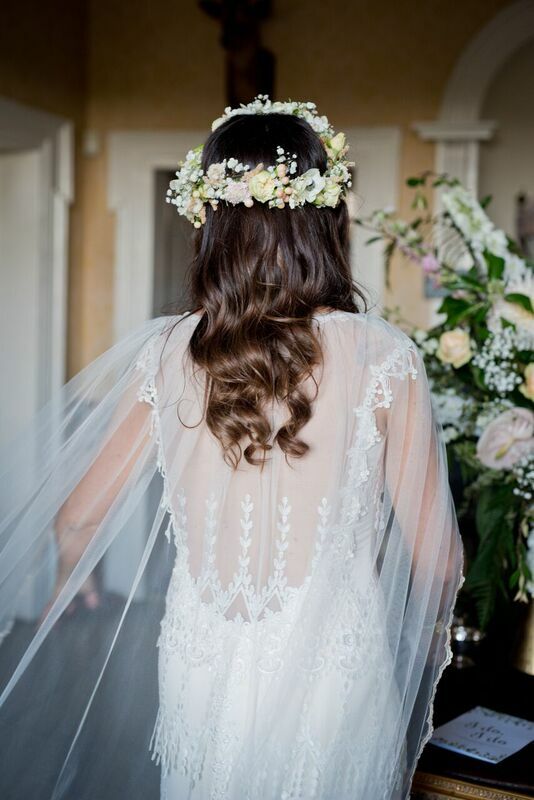 I chose a dress by LA designer Claire Pettibone. To me, her designs ooze romance, bohemian vibes and individuality. I love fashion and I wanted to express my love for it through what I wore to marry the man I love. The Kristene dress ticked all my boxes! The layers and Guipure dangles that shimmied as I moved were what sealed the deal for me. I just loved that no matter where your eyes fell, there was stunning detail to admire. I won’t lie though, once I had said yes to the dress I did doubt myself every few months over whether I made the right choice, but that’s normal apparently! Styling my beautiful guna was a fantastic experience. 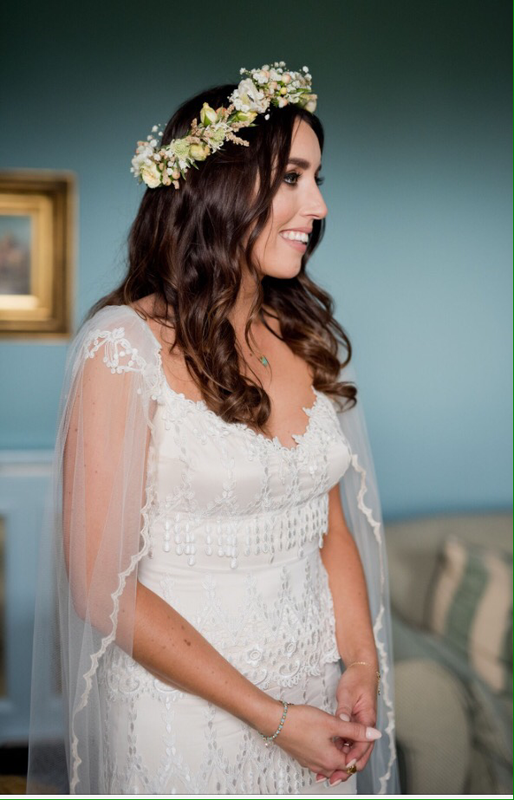 As my dress was the first wedding dress that Claire Pettibone had ever designed (five years ago) I felt I wanted to add a bridal trend that was hot for 2016. I considered dropping the straps and making it come off the shoulder but I’m glad I didn’t, In the end I opted to turn my veil into a cape (a hot trend right now) A few eyebrows were raised when I suggested it but my dressmaker was very optimistic that she could make it work for me, so we went ahead with it. She added five clear buttons along the top of my dress and after removing the comb, she attached the veil to the dress. As my veil was sheer, I wasn’t worried about it hiding the detail on the back, it just added a bit of mystery until I took it off again. I loved how it flowed as I walked and the cathedral length added to the elegance. Accessorising this beauty was a challenge. A challenge I enjoyed of course! On my first day of wedding dress shopping, my cousin Mary who is also my style sister, confidant, ex business partner (you get my drift) we’re close! 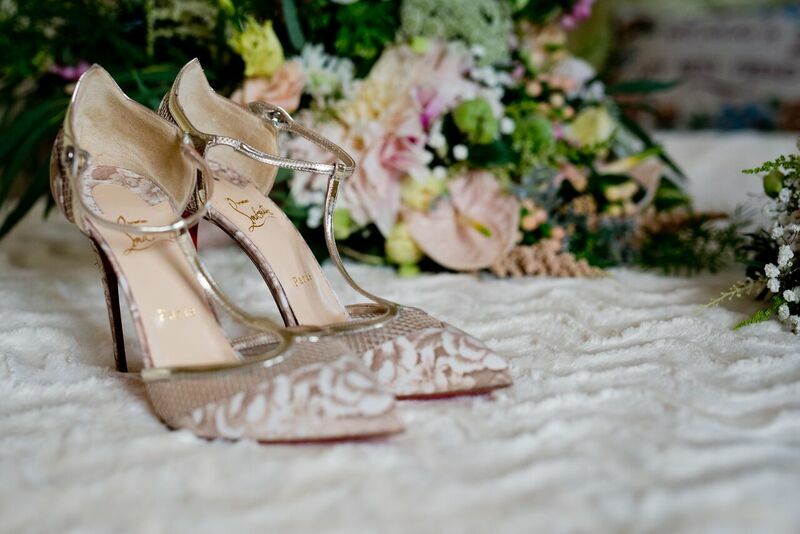 Well, on that day, she said to me “Aileen, you are going to wear a pair of designer shoes with your dress and I’m buying them for you!” I mean, how could I argue with that?! Months of searching for the perfect pair ensued and in the end I chose Christian Louboutins. The red sole, T-Bar strap, mesh detail and printed faille fabric of my “Mrs. Early” shoes were made for my 1930’s inspired wedding dress. 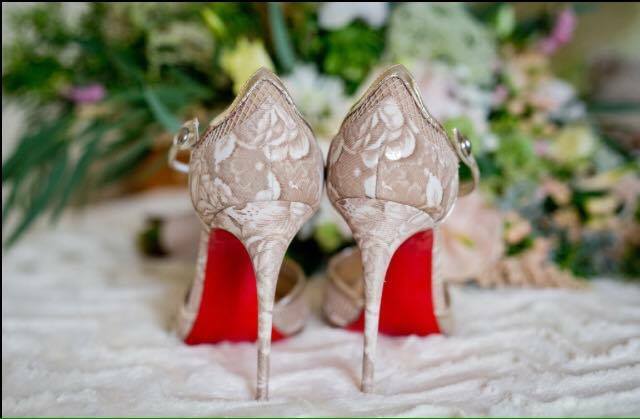 I admit, their stiletto heel wouldn’t be the most bride friendly, but I’m a sucker for a high heel so style won over comfort! Jewellery wise – I wanted pieces that embodied my style and had a bit of character and meaning behind them. 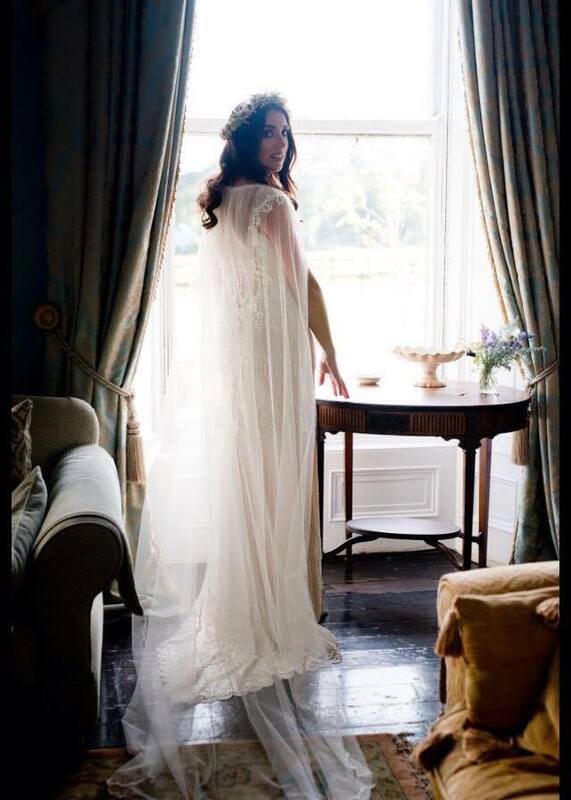 Irish designer Chupi was right up my street. 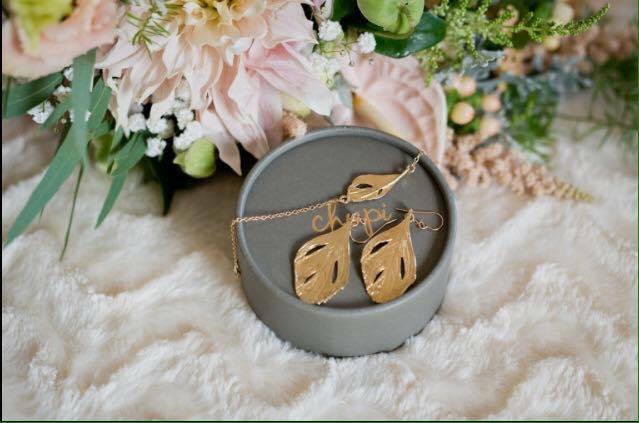 I chose a pair of large gold swan feather earrings that I felt would work well with the gold in my shoes, but before I got to buy them (the day I was going to see my actual dress for the first time) my bridesmaids had beat me to it and bought them for me, thanks to my amazing sister & chief Lorraine for giving them the heads up! I was so chuffed at how thoughtful they were and the earrings were perfect. Next on my wish-list was Chupi’s gold swan feather ring and matching bracelet and as I sit here typing, I swear I had no idea that both of these would be gifted to me too by my godson Harry and my hubby to be. I really felt like the luckiest girl around! When I had all the pieces off my wish list, I hadn’t actually planned on wearing anything else but then my father surprised me with a beautiful gold necklace with turquoise stone by another Irish brand Juvi Designs and my nephew Freddie gifted me with a beautiful bracelet in the same colour as the necklace on the morning of my wedding. Totally unplanned but totally perfect and I decided to wear both of them aswell. They were both delicate pieces that just seemed to fit in so well with my entire look. My makeup was a stressful time for me. I thought I had it in the bag when I booked a well known makeup artist to paint my face. When the time came for my makeup trial I was so excited to see a better version of myself in the mirror, but it wasn’t meant to be. My reflection was pretty ugly. I have spoken before of my acne scars and slightly wonky nose – God I sound divine don’t I? But what stared back at me was all of the above highlighted in the worst possible way. Not concealed or enhanced, I looked ugly. Sadly for me, the makeup artist wasn’t too impressed with my reaction and she wasn’t too keen on rectifying her mistakes nor fit me in for another trial. I left her house disheartened and tearful. I couldn’t wait to remove the makeup when I got home. That night I decided to cancel my makeup artist without having anyone else lined up. I didn’t trust her to do it for my wedding without having another trial. I would’ve rather do it myself than leave my face in her hands. But I contacted another MUA and luckily she was available to fit in just tow of us, so my bridesmaids had to book a different MUA for themselves. It was a bummer and something I had never predicted but we got it sorted in the end. 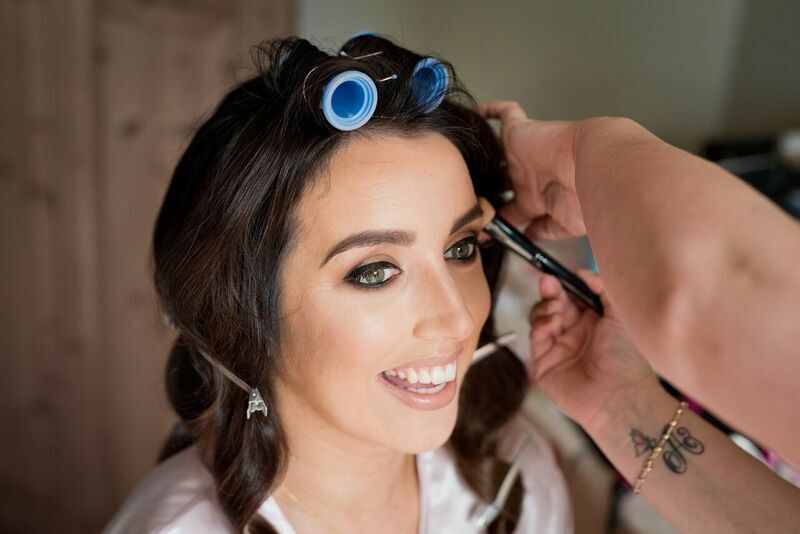 The big lesson I learned from that unfortunate experience is – brides should have a trial done with the MUA that they’re planning on booking beforehand rather than waiting months down the line for the trial only to be disappointed by the result. 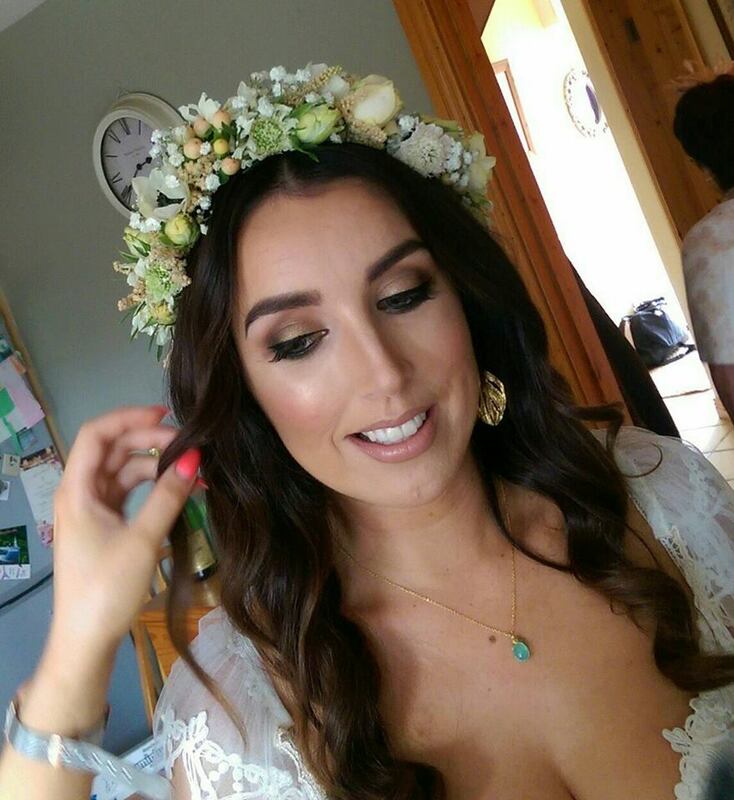 Once I had my second trial done with my new MUA Dawn Coveney, I could relax as I was happy with the outcome. 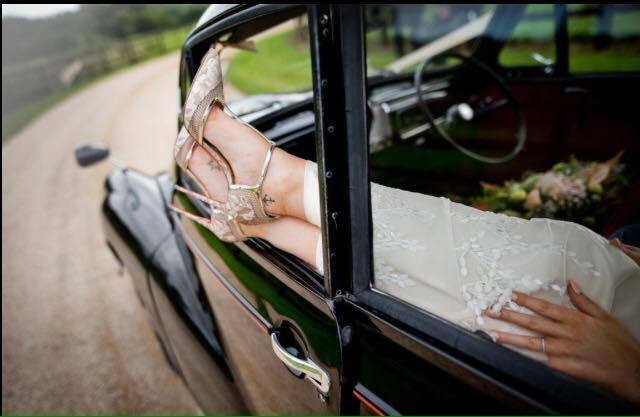 On the day of the wedding she did an even better job! We went for a gold, soft smoky eye, black liner, light contouring and my lips were kept muted with Charlotte Tilbury’s Hot Lips range in Very Victoria, I wanted to have a shade that I knew I would wear again and again and that’s exactly what I have done. Finally, my hair was never going to be too fussy. You won’t find me in a hair salon having an upstyle for a special occasion. I just don’t do up-styles. I wear my hair down alot and that’s the way it suits me, so why would I change that? Luckily I felt my dress worked with my hair down too so my hair stylist Emma (@ Anna Furlong’s Hair Salon) and I decided for a big curl brushed out into a glamourous wave. I wore extensions for thickness so that the curl would last all day and night. Thankfully it did! The flower crown was my plan from the beginning. 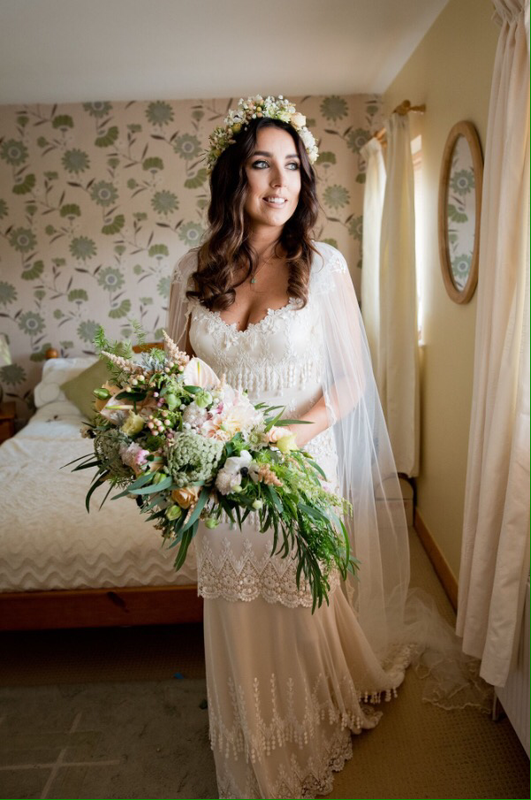 I had always imagined fresh flowers in my hair and my florist Emma @ InWater Florists made me the most stunning crown of anemones, spray roses, hypericum berries, gyp & foliage. I can’t tell you how much I loved styling my wedding look. Overall it was a wonderful experience but I’m relieved to not have to think or worry and stress over it anymore. But now I have an urge to help others style their weddings – Especially the bridal party! You know where to find me…. 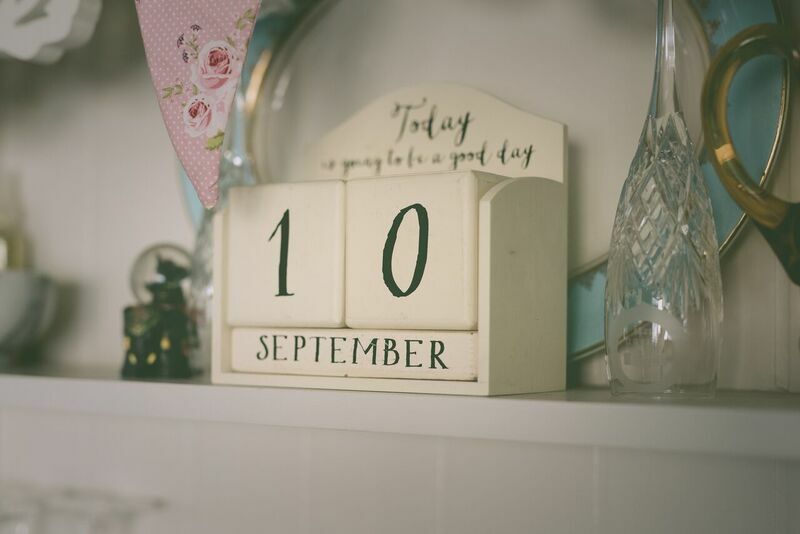 PreviousBreast Cancer Awareness Month – Centra’s #livewell campaign.